My good friends at HiiDef just launched a new app that has been in beta for awhile, Flavors.me. This is an excellent tool that has a great, simple, and usable design. What’s the value preposition of Flavors.me? It’s to unify your various “online identities” into a single, dynamic, automatically-updated, and elegant website. What do I mean by that? OK — so, like most people on the web, you spread public information about yourself in multiple places. 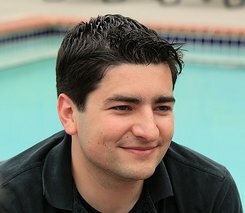 You might run one or two blogs (personal and work?). You might have a Facebook account, a Twitter account. You may share your favorite books at GoodReads, your favorite movies at Netflix, and your favorite music on Last.fm. Flavors.me lets you take all that information and put it together in a single website to serve as your “online identity”. All your publicly shared information, aggregated in one place, and displayed beautifully. Now, that’s the end product. 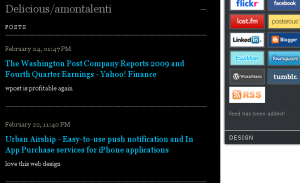 All the content gets pulled dynamically from your various online feeds. The real magic with Flavors.me is how easy it is to get there. 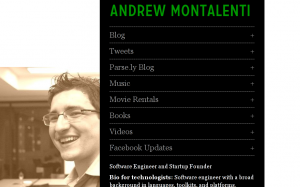 You can drastically change the look and feel of this site using a dynamic, “WYSIWYG” interface. You can do one or two clicks to add a service, reorder it, rename it. Another couple of clicks and you change font sizes, colors, and even the overall layout. 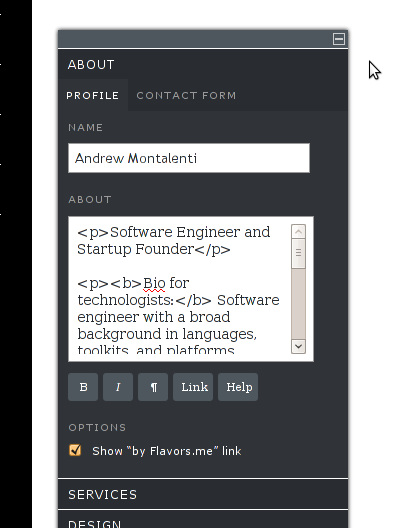 As I was writing this post, I noticed that Flavors.me had added LinkedIn support, which wasn’t available earlier in the beta. So I went ahead and added it. I simply logged in and pulled up the design panel. From there, I could navigate over to “Services”, click the “LinkedIn” logo, and Flavors.me would guide me through the authorization process to make LinkedIn data available to them for display on my page. You simply get redirected to LinkedIn.com, log in there (if not already logged in), and then get redirected back to the Flavors control panel. 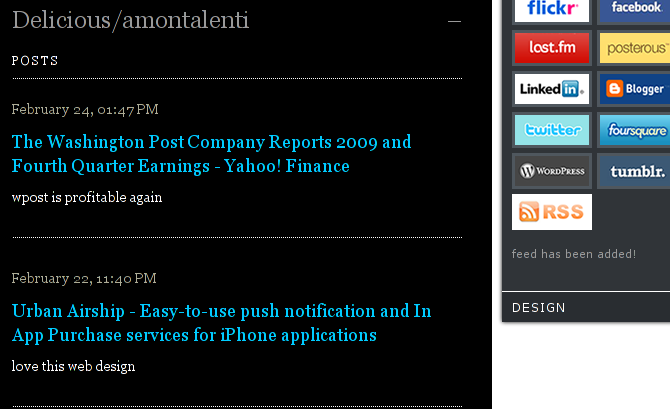 Next, I could simply drag-and-drop the service box in the panel in order to reorder it on the page. Yay, drag-and-drop! There is also in-line editing, and editing the title of the LinkedIn “popout” dynamically updates my profile page in real-time! Nice touch. 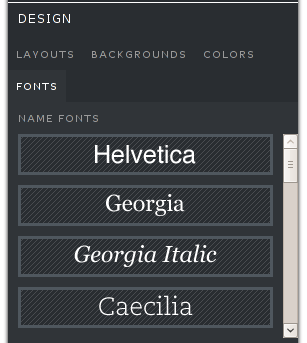 Finally, I can go to the “Design” panel to tweak fonts, layout, sizes, etc. Look at how Flavors.me displays fonts. It’s amazing — this is the web, but it’s easier to change my Flavors.me web design font styles than it is to change font styles in a Microsoft Word document! Now, depending on where, exactly, you store the bits that make up your online identity, you may find yourself disappointed by a lack of this-or-that service. They already support quite a few, and they are adding more in the future, I hear. The one I sorely missed was Delicious, so I could share my bookmarks with the world. But wait! 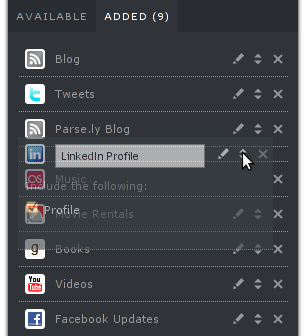 For those services that still don’t have first-class support, Flavors.me gracefully supports RSS feeds of any variety. 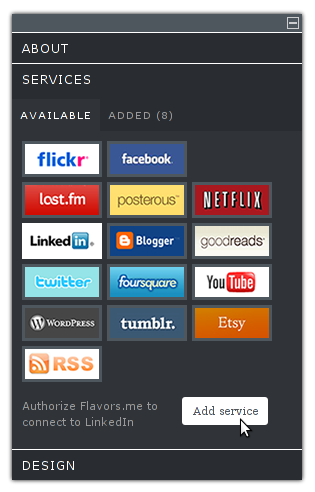 I simply popped the RSS feed for my Delicious bookmarks into Flavors.me services panel, and, voila! — my bookmarks are now publicly shared! It’s this kind of simplicity, design sense, and user-centric approach that makes me love the web as a place to develop, deploy, and use software. So, what are you waiting for? Sign up for Flavors.me today: it’s free! They now have strong competitors too, about.me went live just few days ago (currently down). Then card.ly, http://name.ly. The last one with many other jingly sites. Flavors.me sounds like a good site. I usually have to search for people on every site before I discover what social networks they belong to. This would save me time and concentrate everything I need onto one page. Great idea!